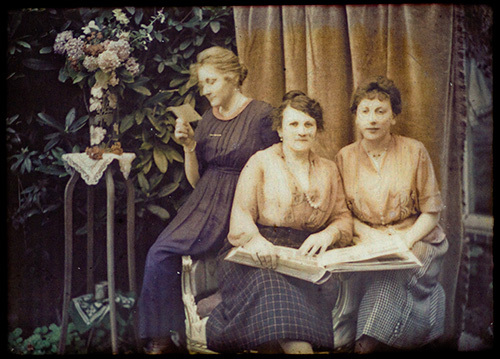 This portrait of three French women was taken on the first commercially successful full-color photographic plate, the Autochrome. The Autochrome was invented in 1903 by two brothers, August and Louis Lumière, of Lyon-Monplaiser, France. It was introduced to a receptive and approving, if not downright excited audience on June 10, 1907. Autochrome plates were manufactured in a wide variety of metric and English sizes to fit most contemporary glass plate cameras. Autochrome photography, a very popular means of making color photographs, was practiced until the mid-1930s. Autochrome plates consist of sheets of glass coated with silver photographic emulsion and starch grains dyed red-orange, green or blue-violet. The minute starch grains act both as color taking and viewing filters. Upon viewing the processed plate, the brain blends the matrix of colored grains into a myriad of colors. Autochrome plates are color transparencies. I wrote an article that contains a simple but more comprehensive description of the Autochrome. See the section titled Albert Kahn's Autochromes. Here is a link to the article. 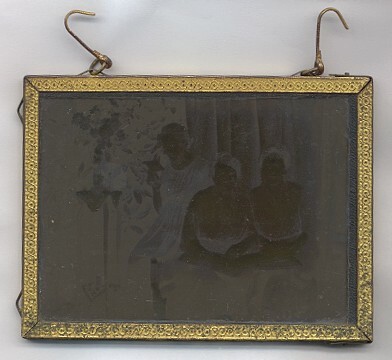 I was surprised to find an Autochrome mounted in this type of frame. It appears that the frame was intended to be hung in a window. Sunlight would eventually bleach the image. This Autochrome is backed by a sheet of opal glass. Its purpose is to diffuse the light for better viewing. Processed Autochromes were prepared with or without a diffusion backing depending upon the intended viewing method. Autochromes can be viewed by projection, in table-top or hand-held Brewster-style viewers, in viewers specially designed for Autochromes, known as Diascopes, or by simply holding them up to the light. Follow this link to view a box of Lumière Autochrome glass plates and this link to see a copy of the USA patent for Autochrome plates. This Autochrome measures 9 x 12 cm.